The warm water ran down my back, rinsing the shampoo from my hair. I turned and picked up my bottle of conditioner. As I lived it from the shelf an enormous wolf spider fell from the bottle and onto the shower wall. I jumped, then started processing options. Squish it. Bad luck. Rinse it down the drain. Dear God, it could land on me or crawl up my foot. Then I looked closer. The little guy was slipping on the shower wall, his tiny hairy legs trying to get purchase while his mandibles flexed. He was scared too. I sighed and in my very vulnerable state looked for something to catch him in. Shave gel top? Perfect. 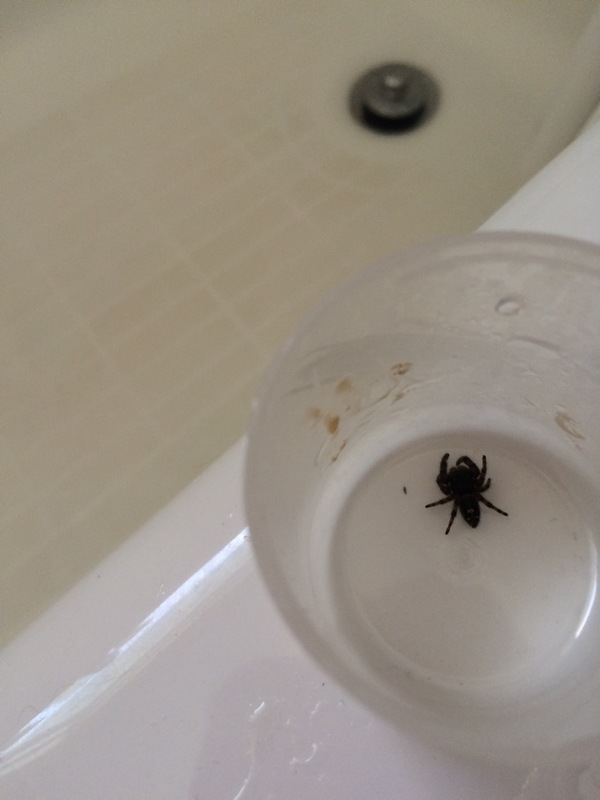 I coerced the spider into the lid and once he was firmly captured I opened the shower curtain and flung top and spider into the sink. Once I was dry and covered, I took Mr. Spider in his lid to the front door and set him outside in the plant. Good luck with the snow tomorrow, and stay out of my bathroom! That’s the only thing I don’t like about living in my current apartment. Lots of spider visitors. And I hate spiders inside. Oh an it’s that time of year when they come in from the cold. Eek! So creepy. I live with someone who is terrified of spiders. I’m afraid of dogs and their big teeth. Well yeah, my grandma told me the same thing. I’m hoping he gets some bugs before he freezes out there. I love spiders in Nature, but not in my shower! I am terrified of spiders and if I saw one that big I probably would have passed out in the shower. You’re a better woman than me for sparing it’s life. If you passed out it might have crawled on you!!! True! Seriously I would have freaked out. They give me panic attacks. Kudos to you!